The Circuit is not an Origional design by me, but very useful. it available to those persons not familiar with this method of Voltage Regulation. One application is where you need a Higher Power Zener, Possibly even a 100 watt rating. and use Diode De-coupling between it and the battery. use. 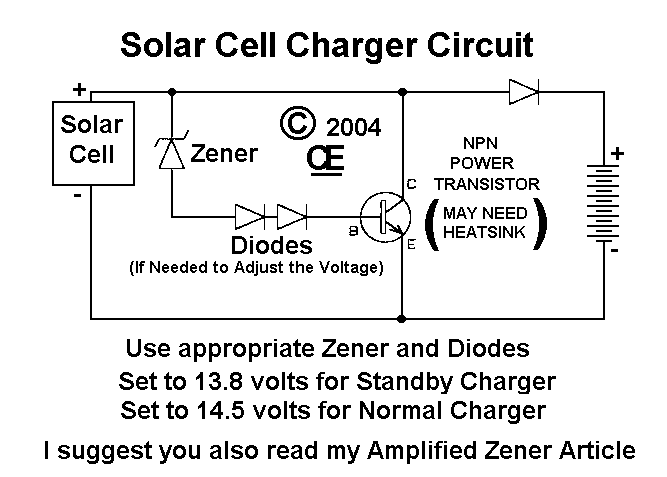 Or use a 14 volt zener a diode for a Standard 14.6 volt charge. Therefore a 14 volt zener will result in a 14.6 volt Amplified Zener. about 0.6 volts. A 1N5819 Schotkey diode will increase the voltage by about 0.3 volts. 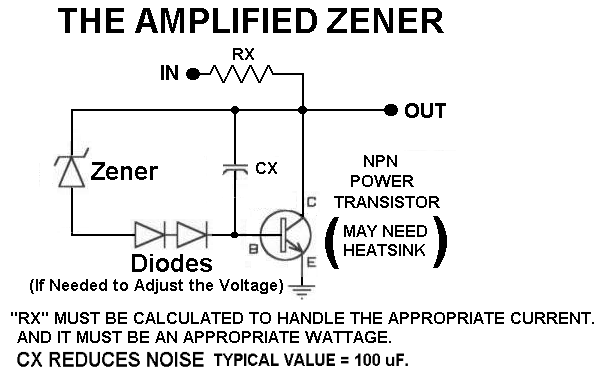 so any 250 mW (or greater) zener is acceptable. NOTE: Zener Diodes are usually available in tolerances of 5%, 10% and 20%. A 12 volt Zener, with a 20% tolerance can be anything between 9.6 volts to 14.4 volts. That is a Huge Variation and can Greatly affect your results. "This circuit can be used as if it were a powerful zener"
"This is the Circuit for charging a Lead acid Battery"
NOTE: This is Not really Practical for Charging NiCads or NiMh Batteries. These types of batteries require a different type of regulator to protect them from overcharging and heat damage.